We knew it was more than likely going to happen sometime, but we honestly didn’t think we would see one so soon. Direct from the Shenzhen, Guangdong province in China, the counterfeit capital of Asia, comes the iPad Clone! Yes manufacturer Shenzhen Huayi, has already counterfeited the iPad, which really looks kinda neat a first. It looks like a giant iPod with the unmistakable click-wheel, and a stylus pen friendly touchscreen. 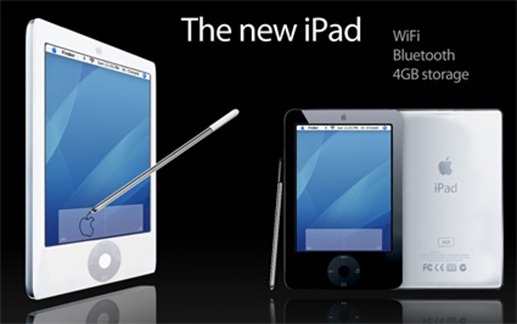 The giant 4GB take on the Apple iPad comes with Wifi, bluetooth and a rip off of the OSX operating system. Now there isn’t too much really known about the OS itself, but we have all thought about buying a counterfeit Apple product, maybe a computer show or online. But it is really inferior quality, that’s why there is companies like Apple and then there’s everyone else. But if you are on a budget, and don’t care for a lagging OS, unresponsive touchscreen, and all together cheap build, then the iPad clone is for you! It will be released along side the “real” iPad on April 3rd, and the cost will be for 2,000 Yuan ($290). Just don’t say we didn’t warn you! Previous Entry: Steam for Mac beta Program to Start Soon- Get your application in now! Next Entry: Nokia Maemo Running on HTC HD2, Fake ?